In today’s post, I would like to share some of my favorite Robert Butwin quotes from his popular book “Street Smart Network Marketing: How I Turned Initial Failure Into Massive MLM Success”. I have to tell you that I really enjoyed this book and consider it a must read for anyone who wants to take their network marketing business to the next level. One of my network marketing mentors recommended this book to me and I am glad that she did. I ordered it used on Amazon the day after my mentor recommended it. Within a few days it was delivered in the mail and I started reading it immediately. I read the book in two days. It was that good. This little book is just filled with wisdom and Golden Nuggets. I really enjoy Robert’s writing style. He tells stories, keeps things simple, knows what he is talking about, and he is to the point. What I like most about Robert Butwin’s book is that he is a very successful distributor in his own right, having built a HUGE MLM Team himself. Listed below are my favorite 22 Robert Butwin quotes from his book “Street Smart Network Marketing”. They are listed in order by where I found them in the book. Each quote is in bold and italics. I also provide my own thoughts about each quote immediately after it. # 1 Never pre-judge people in the business. And never give up on people who are willing to learn. You really don’t know WHO will build the business. People will fool you, more often than not. Sometimes the people you think will quit will become your most successful distributors, and sometimes the people who are excited and talk a big game will fizzle out quickly. The best thing you can do is offer help and support to everyone on your team and then work with the people who are actually putting in the effort and doing the work. Read more about pre-judging vs. pre-qualifying. # 2 Ultimately the driving force behind any network marketing business is the product or service that you are offering. If the product doesn’t offer the consumer real tangible benefits, or if they can get the same results better or cheaper somewhere else, forget it. I’ve said this time and time again on this website, but you MUST have a product or service that is a good deal for the retail customer. If your product or service is so expensive that no one can afford it, so weird that no one will use it, and so bad that no one wants it, you won’t make any retail sales and you won’t have a sustainable network marketing business. Read more about why the products are so important. # 3 … You want to focus your energies on the people who are producing the results in the business. This advice is pretty simple. Work with the people on your team who are actually doing the work. Work with the willing. Don’t waste your time with the tire kickers. The beauty of this business is you only need a few serious people to build a big team. Read more about working with the right people. # 4 Mentors come first – THEN comes success! All successful people in life and in business have a mentor. Do yourself a favor and find a mentor to help you in your network marketing business, right from the beginning. Look for someone who is successful in your upline, who has want you want, and humble yourself enough to ask them for advice and do what they recommend. Read more about finding a MLM Mentor. # 5 Don’t limit the ways you have of attracting people – and using the mail is one very powerful way. Ideally, you want several different lead generation strategies. When you first start out with your business, you can follow one strategy, but once you learn the basics of it, you should diversify yourself, in case that lead generation strategy dries up! Direct mail should be one of those strategies. Even just mailing out ten to twenty postcards each week can give you a positive return. Read more about different lead generation strategies. # 6 The most successful sponsors I know of in network marketing can point to TWO, THREE or FOUR leaders in their organizations who are responsible for generating most of their income. Please take note of this. 80% or more of your income will come from one to three people on your team. You might have to sponsor a lot of people to find those one to three people, but when you do it is worth it. Read more about how a couple of leaders will generate most of your income. # 7 Work your tail off… learn everything you can about this business … hang out with powerful people who are making it happen… and, after a couple of years, you WILL get lucky. Associate with people who have what you want and you will be amazed at what happens. Don’t hang around quitters, whiners, or people with bad attitudes. Associate with other movers and shakers in your company and it will rub off on you. Learn more about being persistent and consistent in your business. # 8 Your success in this business boils down to you. Your company, your products, your upline, your system, your training and all those other things are important, but are NOT the factor for your success. The most important part of your success equation is YOU. You must do the work. You must be consistent and persistent. You must hold yourself accountable. Your business in your hands. What you do with it is up to you. Read more about why you are responsible for your own success. # 9 If you don’t have multiplication, if your growth is merely additive, you’ll either burn out, accomplish nothing – or both. If the people on your team are not duplicating what you are doing, you will spin your wheels, get tired and burn out. You need to get your team to do some work and duplicate YOU by finding customers and distributors themselves. Until that happens, you won’t achieve much success in your business, and you won’t make much money! Learn more about duplication in network marketing. # 10 Five is really the magic number in our business. Find five WINNERS who want to build a big business and you can be set for a long time. Yes, you might have to sponsor 100 to 500 people to find those five serious people, but it’s worth it. Ultimately, you really only need a few serious people to make big bucks in MLM. Read more about why five is the magic number in MLM. # 11 Instead of counting how many prospects you’ve signed up, count the number of times you’ve enthusiastically shared your opportunity. Results follow activity. If you are spending most of your “work” time on the income producing activities, the numbers will work themselves out.The quickest way to know whether someone will be successful or not in the business is to find out how many times they have shown the plan this month. Learn more about sowing and reaping. # 12 If you want people’s time, effort and energy, you must help them create results almost immediately. Your new recruit will not stay enthusiastic very long. You only have about 30 to 60 days to help get your new team member started right and achieve success, before they quit and move on the to the next thing. Learn more about helping your new distributors get started right. # 13 Your average income equals the average of the earnings of your ten closest and best friends. Who you hang out with will ultimately determine where you end up in life and how much money you make. Hang out with criminals and you will become a criminal. Hang out with winners and you will become a winner. It’s really that simple. We know this applies for our kids, but as adults, we usually forget the concept ourselves. Learn more about the power of association in network marketing. # 14 Remember, your job is to give people a choice – not to convince or get them to do anything. Your job is to sift and sort through people, not pressure or convince them. You are simply sharing the products and business opportunity with others and working with the people who raise their hand and are interested. If you try to convince people, you might sponsor more folks but they will quit the business just as fast as they joined. Learn more about sifting and sorting in your MLM Business. # 15 Prospecting is about the message, not the messenger. Your job is to deliver the message to everyone you meet. Keep delivering the message every single day and you will find people who are interested in your message. Be the messenger, not the message. Learn more prospecting tips. # 16 Do not let new people go it alone. Try to get your new team members plugged in to your upline, training, meetings and systems, as soon as possible. If they try to be the lone wolf, they will quit. Success in this business requires people to be plugged in! This is a team sport. Learn how to help your new distributor get started right. # 17 The primary reason I use tools to do the work is that they are completely duplicatable. Tools are your friend in network marketing. Tools keep the business simple and allow anyone to become successful.You want your business so easy to do that a caveman could do it. Make it complex and no one else will be able to figure it out. Use third-party tools whenever possible. Read more about using third-party tools to grow your MLM Business. # 18 Follow through is the single most important missing element in the way people approach this business. The money is in the follow-up. Never forget that. Very few people will just sign up after seeing a presentation. You have to follow-up with them consistently and lead them through the closing process. If you don’t follow-up with people, don’t expect much to happen in your business. Read more about following up. # 19 I structure 99 percent of my time around the phone. In fact, most everybody that I know who is making significant dollars in this business does the majority of their work on the phone. The phone is your friend. It is the fastest and easiest way to build your business. You can talk to more prospects over the phone in a quicker amount of time than you ever could face-to-face. Leverage the phone as much as possible. Read more about using the phone to grow your network marketing business. # 20 Twenty percent of my people are responsible for 80 percent of my group’s results. 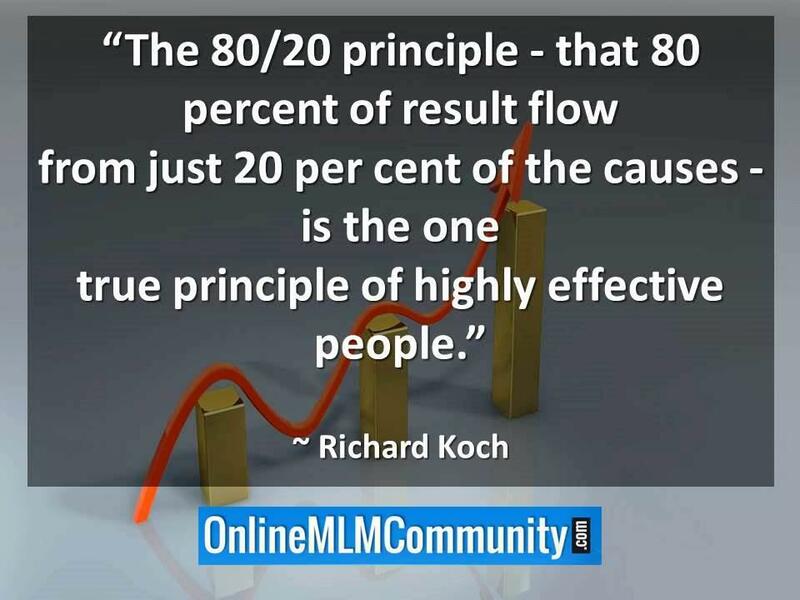 The 20/80 Rule holds true in network marketing too. Focus 80% of your efforts on the 20% of your people doing the work. Learn more about the 20/80 Rule. # 21 It is a must – get a business card of every single person you come in contact with. Rather than give your business card to everyone you meet, focus on getting their business card instead. Follow-up with the person within a day or two. Add their business card to your database and follow-up with them every three to six months until they join or die! Read more about collecting business cards. # 22 One of the biggest reasons people drop out of this business is false expectations. Many people entering the MLM world expect to be making the big bucks right away. They think you can start a business and be in the profits right away. Most network marketers have never owned a business before, so they don’t understand that it normally takes a year or two just to get profitable and figure things out, and two to five years to earn a nice income. If you have the lottery mentality you won’t make it very long in MLM. Read more about false expectations in MLM. 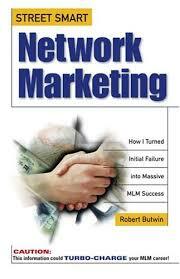 In summary, I thought the book “Street Smart Network Marketing” by Robert Butwin was a really good book. Overall, I give it 8 of 10 stars and recommend you buy a copy and add it to your leader’s library. It was published in 1997 by Prima Publishing. You can order a copy on Amazon right here. What are your thoughts? If you’ve read “Street Smart Network Marketing” by Robert Butwin before, I would love to hear from you. What was your favorite quote from the book? What did you think about the book? Leave a comment below to share your thoughts! Have a great day! I like quote number three about focusing on the individuals who are building the business. Sometimes you might want to focus your attention on those who are falling behind in order to try to bring them to where you want to them to be, but often this is so draining and they still end up being a dud. By investing in the individuals who are actually showing promise, you are only building the business and increasing you own success versus wasting energy on someone who is not worth the time. I had to “pipe” back in on this post. After reading it again (I could read this post daily for 1 year and still get from it), #5 really is standing out today. Sometimes we limit ourselves in terrible ways. Personally, I believe we need to use every resource we possibly can. As the book says, the mail. I think the internet, flyers, the phone, advertisements in publications, and most of all, face-to-face are all highly important in offering our products and opportunities. The more we use, the better our odds. I agree with you that using different techniques to generate leads and find customers is a great idea. Wow Chuck, there are some great quotes within this book. I could go on and on about each quote, but since you are going to do a mini series, I will save some. I want to touch on the prejudging people one though; it reminds me of something that happened some years ago. As a salesperson, it can get easy to try and judge if people can “afford” what we are selling. I had sent a salesman to an old farmer in South Dakota on a house siding lead. The salesman called back and said, “No way. He only has 1 arm and has a 2 1/2 story house that was probably built in the 1800’s.” The salesman was a prejudger, so I called up the best of the best–my sales friend Ray. Ray drove to the farm where the old man was attempting to hook a plow up to his tractor. Ray took off his suit coat and hooked up the plow. He then proceeded to show the guy our siding. To make a long story short, we had a sale that day. The biggest sale of the year for our company on a residential. The man walked into his house to get the down-payment on the siding he just bought. He brought out $28,000 in $100 bills. The total sale was $82,350. Lesson learned: Do not prejudge people! Good story, Greg. This is so true.